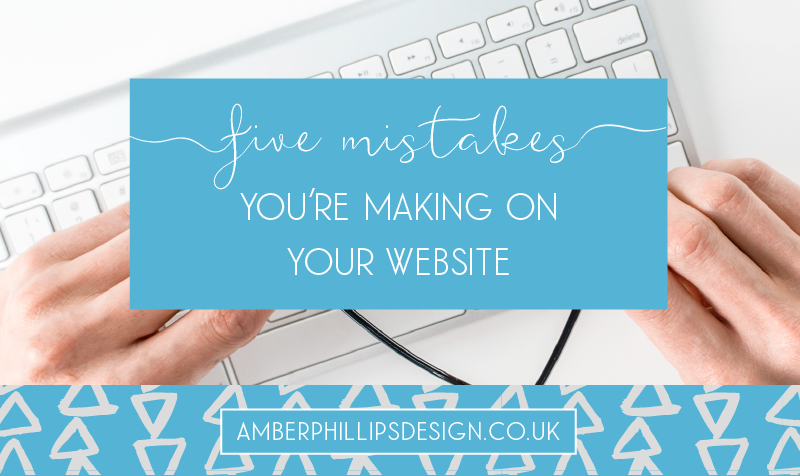 You might be surprised to find that none of the 5 biggest mistakes I’ll be talking about today are to do with how lovely your website looks. By responsive, I mean the website adapts to the screen you’re viewing it on, whether thats mobile, tablet or desktop. Have you ever been to a website on your mobile and you’ve had to zoom in and scroll all over the place, up, down, left, right, to actually read the text? If you look at the same website on your laptop, it probably looks absolutely fine. That’s an example of an unresponsive website. You should be able to go to a website on any device and clearly see and interact with the website. Read more about responsive websites here. Don’t hide your contact information! If people can’t get in touch with you easily, then they may not bother at all. It’s easy to set up an email address and/or account that is personalised to your domain name e.g. info@amberphillipsdesign.co.uk. These are the most professional looking email addresses to have for your business and I’d really recommend setting it up and displaying the email address prominently on your site. The first person you should contact if you need help with this is your website host or the company that hosts your domain name. They should be able to set it up or advise you on what to do. If you need any extra help, feel free to get in touch with me! Regarding phone numbers… Not everyone likes to have their phone number visible on their website. Perhaps they work on their business in unsociable hours, perhaps they don’t want spam calls, perhaps they just hate speaking on the phone… The most important thing is your email address but its really beneficial to have a phone number too if you can. If you’re worried about people having your personal number, consider setting up a business number that redirects and hides your personal number using something like citynumbers.co.uk. At the very least you should have a contact form that goes straight to your email. A reiteration of this simple sentence or slogan should be sprinkled through your copy and feature on all pages throughout your website. If people can’t figure out what you actually offer and if you’re able to help them, you’ll either waste your time replying to enquiries saying ‘sorry I don’t actually offer that service’ or you’ll be missing out completely on customers who will just find what they need elsewhere. E.g. 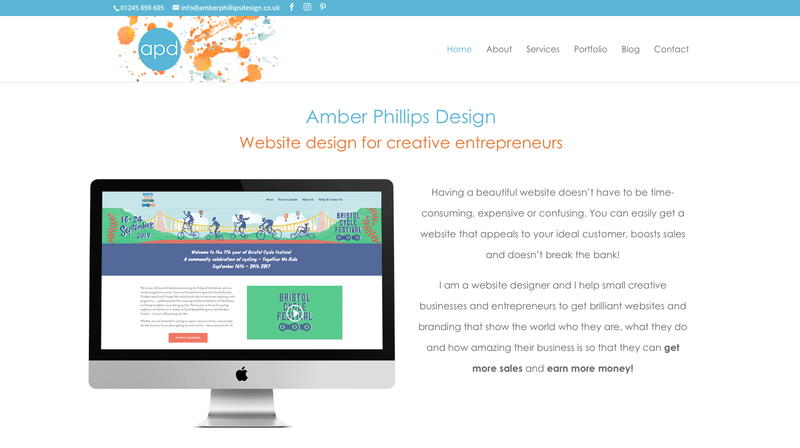 Hi, I’m Amber and I help small creative businesses and entrepreneurs to create a website that looks great and makes them sales. Images can make or break a website. You could have a crazy simple website that just has beautiful photos and it’d look lovely! But bad photos, no matter how well set out the website is, can devalue the site. I’ve written a post about this before that you can read here. It’s all about whether to hire a professional photographer, buy stock photos or take the photos yourself, with tips on how to do so. If your website is really slow to load, then people might not bother waiting. It’s a sad truth… According to Kissmetrics, 47% of consumers expect websites to load in 2 seconds or less, and 40% will abandon a page that takes three or more seconds! You can put a ton of effort in to the content and design of your website, but if the site is too slow to load then you could be losing visitors. Find out how quick your website is by using tools like Pingdom and Google Page Speed Insights. If you use WordPress, remove any unused plugins. Also remove any that haven’t released updates in a long time and any that aren’t from trusted sources. Remove any that do a function that you could easily do without a plugin. Resize and compress your images – Make sure your images have a resolution of 72dpi and preferably resize them to the size they need to be before you upload them to your website. A good plugin that resizes and compresses image sizes is WP Smush. Get in touch with your host to see if they can do anything and maybe also consider another host that can offer better speeds! There are tons of different ways you can speed up your website. Just Google ‘increase website speed’ and then the platform your website is built with and you’ll get loads of suggestions. I’m hoping to write a post soon all about increasing website speed for WordPress websites so stay tuned! I could go on and on about different things that could be improved on a website, but these 5 are the biggest issues in my opinion. If you’re interested in a more personalised review to see where you could improve your website, then please get in touch! I’ve just launched a new website review feature on my Facebook page and it’s totally free. Each Wednesday I feature a different small business or entrepreneur and review their website on a Facebook live video. 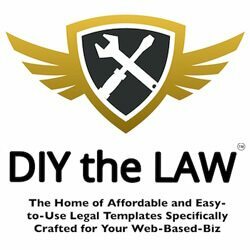 I don’t rip the website apart, instead I offer helpful tips to improve their website based on the goal they want to achieve, whether that’s more discovery calls, more newsletter sign ups or more sales of a specific product/service. If you’d like to take part, please fill in the form below and I’ll get back to you asap! Subscribe to download my free ebook with 25 super easy ways to drive traffic to your website, and also receive my newsletter twice a month with simple, to the point, information and resources to help you develop your business!